This post is a response to a challenge set, as a result of Task 2, by Frank Polster, a fellow course participant on Stephen Downes’ MOOC, E-Learning 3.0. Here is my challenge to all the E-Learning 3.0 cohort and a task associated with course module E-Learning 1 and 2 Conversation with George Siemens. Please comment on what fields, skills, talents, and education that you think are unique domains of humans like Stephen’s “kindness and compassion” and the skills, talents, and education required for the “ghost in the machine” that provides that alternative view. 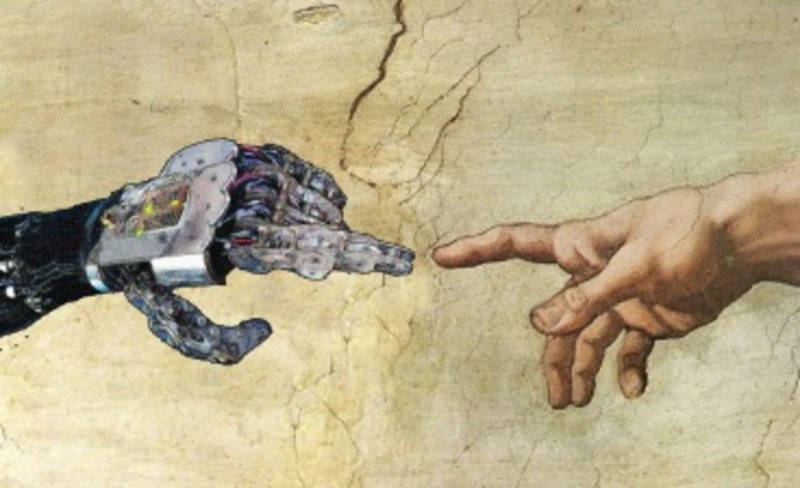 I have given this post the Title, E-Learning 3.0: The Human versus the Machine, because that is how I have interpreted this challenge. My response to the challenge is based on what I have learned from reading the work of Iain McGilchrist, author of The Master and his Emissary: The Divided Brain and the Making of The Western World. McGilchrist’s writing focusses on the differences between the ways in which the left hemisphere and the right hemisphere of the brain view and attend to the world. For example, the left hemisphere’s view of the body is as a machine. The right hemisphere’s view of the body is as a living whole in nature. Priests, teachers, doctors, and similar professions do this as part of their jobs, through care, empathy, trust, altruism, kindness and compassion. They are able to put themselves in the position of the ‘Other’ and experience their experience. Human beings can experience not only their own pain, but also the pain of others. Human beings can love. We can also see all this in family relationships. Other characteristics unique to humans are the ability to recognise and experience beauty, awe and wonder, in art, music, dance and nature, and to value wisdom, intuition, metaphor, ambiguity, uncertainty, flexibility, the implicit and the spiritual. Human beings experience emotions such as humour, fear, anger, anxiety and sadness, and affective states such as hope and optimism; they have a sense of self, an understanding of the uniqueness of the individual, and search for meaning and truth in life. They do this through embodied engagement with the world, not detached abstract contemplation of it or separation from it. Human beings can imagine, wonder and dream. An education which values the uniquely human is one that focusses on learning the meaning of ‘Other’, recognising the value of living things, nature and the unknown, learning how to think in an embodied way, and acknowledging that thinking and feeling can’t be separated. The second part of Frank’s challenge is – comment on the skills, talents, and education required for the “ghost in the machine” that provides that alternative view. ‘Ghost in the machine’ is not an idea I am very familiar with, but what I have read seems to imply that it questions whether there is a ghost in your machine making it work and whether you can put a ‘non-physical mind’ into a physical machine. This of course relates to Descartes’ argument that mind and body can function separately. My understanding is that this idea of body/mind dualism has long been discredited, so I’m wondering if it is worth taking the idea of ‘ghost in the machine’ seriously, although there are scientists working on trying to understand what’s unique about humans and to replicate this in robots. If Frank is asking what human-like skills could be adopted by a machine, then I would say only those skills that can be programmed by a human being, and that there are unique qualities of humans, as discussed above, that are immeasurable and cannot be programmed. A machine, if programmed correctly, can perform many of the tasks a human can do, but it cannot do or be programmed for the important, immeasurable tasks and qualities that are so essential for a meaningful life. And if I am wrong and machines will ultimately be able to replicate humans, then, as I think Frank is asking, what checks should be put in place in a machine to ensure that the machine always has access to an alternative perspective. If we value what is unique about humans, then machines should be programmed to ensure that human beings are never prevented from experiencing the ‘Other’, or thinking and feeling in an embodied way.